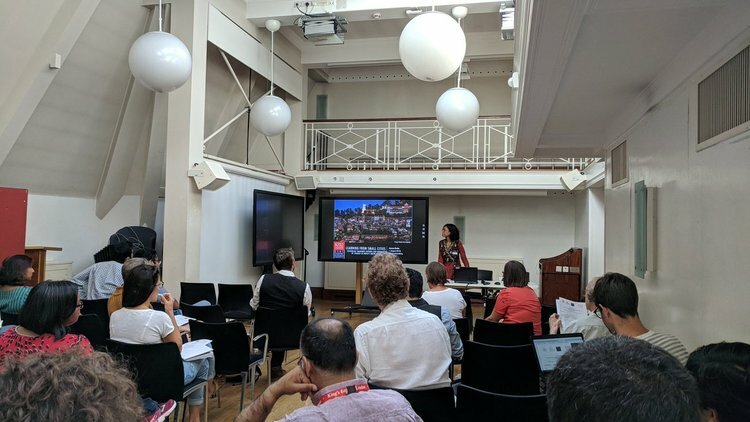 The project was launched at a well-attended workshop hosted by King’s College London on August 1st, 2018. The event brought together the project team, interested academics with allied research interests, and societal practitioners working within the broad field of urban change. The primary aim of the workshop was to share the project objectives, research questions, and methodology with an informed audience that could offer valuable feedback. Another aim was to liaise with the larger community of researchers and professionals working within the relevant field, who could contribute to the steering of the project as advisers and facilitators. The events of the day consisted of four thematically organized sessions. In the first session the UK team members presented their ongoing work on the topic of small smart cities and shared their visions for the project. In the second session, titled ‘Small Cities: Dynamics of Change in an Urban Age’, the presentations covered both historical and emerging aspects of scholarship on small cities in India. In the third session the presentations focused on participatory and community-led aspects of understanding citizen’s engagement with smartness in cities. In the final session, titled ‘Smart Cities and Social Justice’, questions of right to the city, the role of the grassroots, and the creation of new social differences were taken up by the presenters. The day concluded with a roundtable discussion wherein the project team took note of feedback and comments from the audience and co-presenters on the overall project strategy. You can find all of the videos of the presentations, panels, Q and As and roundtables from the day here. The contents of each of the presentations are summarized below. ﻿Dr. Datta flagged off the workshop with an introduction to the project team. She started with an outline of the research questions, conceptual underpinnings and motivations behind the project. Calling attention to the gap in postcolonial urban theory regarding small urban centres, Dr. Datta foregrounded the influence and reach of ‘smallness’ rather than mere demographic characteristics. She set this against the unfolding paradigm of digitization and technology-led smart urbanism, wherein small cities have become the testing grounds for state experiments with urbanisation. Dr. Datta concluded with the methodological tools and expected impacts. ﻿Dr. Hadfield-Hill presented the Map My Community app that she has developed as part of her previous project. The app has been well-received by the involved stakeholders and Dr. Hadfield-Hill is now working on adapting the app to the current project on small smart cities. Initially developed as part of the ESRC-funded project ‘New Urbanisms in India’, the app seeks to record urban transformation as experienced by children and families. The diverse set of participants were themselves involved in designing the interface of the app and the inputs included both audio-visual and textual material. One of the stakeholders – Humara Bachpan – later adapted the mapping tool into a tool for youth-led advocacy. Dr. Butcher presented the findings and outputs from ‘Creating Hackney as Home’ – a project that centred young peoples’ experiences through community asset mapping (CAM) as one of the key methodological tools. She presented the meaning of home in a rapidly transforming urban context. Dr. Butcher also shared a short film created by one of the young participants of the project documenting her experience of gentrification, which generated an engaged discussion afterwards. In terms of its connection to the current project on smart small cities, Dr. Butcher pointed out aspects of futuring, loss, and participatory research that have both thematic and methodological relevance for our work. Prof. Satterthwaite presented the key findings from his work in small and intermediate urban centres across India, Ghana, Sudan, Nigeria, and Argentina in the early 1980s. These studies were aimed at understanding the historical evolution of urban systems within specific regions over extended periods of time. Specifically, the studies attempted to discern the social, economic, and political factors behind some city-regions growing and thriving while others remained static and stagnant. Among the most important factors that could be detected, was the issue of governance. A well-funded and well-functioning local urban governance machinery was found to be crucial to sustain and manage the growth of a small city. At the same time the inherent competence within the city that could successfully attract global and/or national capital investments was also found to be important. However, the existence of competence and good governance were also strongly related to political will. Thus, decisions about public investments into capacity building and strengthening of governance structures in small cities, were often motivated by political strategy rather than by the logic of economic efficiency. The future of small cities was therefore found to be hinged on the extent of centralization within the urban governance system of the country in question and the extent to which it was willing to allocate resources, responsibility, and accountability to small city governance. Institutional Heterogeneity, Associational Life and Governance in India’s Small Cities. Continuing with the theme of governance, Dr. Cornea highlighted the importance of understanding the heterogeneity of institutional actors and forms of influence within urban governance in India – something that is not adequately captured in the current scholarship within the field. Her presentation further emphasized on how these actors differ from metropolises like Delhi and Bangalore to small cities such as Navsari and Barddhaman. Dr. Cornea drew from her doctoral study in the district headquarter town of Barddhaman in West Bengal, India to discuss the dynamic of environmental governance in unremarkable small cities through the lens of urban political ecology. In the context of West Bengal, Dr. Cornea described the pre-eminence of civil society actors such as neighbourhood-based social ‘clubs’ and high-profile private citizens who play a role in re-configuring the use of city space and resources often to the detriment of already marginalized sections. This is in stark contrast to the role played by actors representing private capital and the real-estate conglomerates in the metropolitan context. These civil society actors were found to be engaging in territorialisation practices that led to the production of governable spaces, and to be acting as both alternatives to and intermediaries between the state. To understand these deeply politicized processes of micro-level governance in India’s small cities, the scholarship on the topic must reflect the institutional heterogeneity characterizing this phenomenon. Dr. Sircar presented her doctoral work on census towns – the smallest size-class of urban settlements in India. Through the case study of Garbeta town she put into question the dominant understandings of both smartness and smallness in the Indian context. Drawing attention to the overwhelming metrocentricity in urban discourse, Dr. Sircar argued that small cities emerge onto the terrain of urban planning and policy-making only when they are able to mimic the metropole in both geographical and ontological terms. She further brought attention to the well-known concept of jugaad and how it might be useful in conceptualizing the localized iterations of smartness in small cities i.e. the improvised ways in which digital technologies are deployed by residents to improve and make sense of their urban experience. Please find her presentation slides here. Ms. de Sousa led a community asset mapping exercise for the participants at the workshop. The exercise was carried out in smaller groups of ten to twelve members each. Each group member was asked to nominate one or a few places from their neighbourhood that they considered to be an asset. The groups then gathered around flip charts with a series of concentric circles drawn on them and placed their nominations (noted down on post-its) around the outer-most circle on the charts. The group then had to discuss and nominate places to be moved into the inner circles, based on their perceived value as assets, until the inner-most circle had been reached. The idea behind the exercise was to demonstrate how places are valued as assets from an individual vs a community perspective. The exercise was carried out by four different groups and the results presented in the ensuing discussions. These discussions were further enriched by insights from Ms. de Sousa from her practitioner work with communities through similar asset mapping exercises. Dr. Gupte’s presentation focused on moving away from a technocratic understanding of smartness to thinking about how the application of technology can be made more innovative and inclusive. The presentation threw light upon aspects of urban life within the smart age, that were not changing and that remained stable despite the shifting policy paradigms. These include the actual relationship between labour and technology in the construction of the built-environment, the intrinsic exclusion of area-based development approaches as opposed to pan-city development, and the dissonance between the visions of everyday residents and those of planners and policy-makers. Dr. Gupte cited examples from his fieldwork in Bangladesh to illustrate how the big-data driven planning approach failed to resonate with the vivid aspirations of the city-dwellers. The need of the hour therefore is to shift focus from big data and/or smart data to more inclusive data. Dr. King presented the preliminary findings from a study that looked at all 98 successful bids made by cities competing to be included in the smart cities mission. She further shared learnings from fieldwork conducted in three different municipalities to understand how the mandatory component of citizen’s participation was interpreted and implemented by the state actors. The study revealed that more educated and economically influential citizens’ groups had a stronger say in shaping the smart city interventions. Their suggestions and inputs were not only taken seriously by municipality officials but also further refined and presented back to them for approval. In the leading city of Bhubaneswar, the municipality officials acknowledged that their approach to citizens’ participation might have been tokenistic to the extent that it was the perception of participation that was foregrounded in their bid rather than the quality or meaningfulness of participation itself. Overall the study exposed the limitations of digitally focused modes of participation. Dr. Cowley grounded his presentation in the concept of “hybridisation” – the process through which global discourses of smart cities get translated into localized policy initiatives and a set of specific activities. Through the case study of Wuhan – a 10 million strong city in central China – Dr. Cowley argued that the role of national level governments is often overlooked in this process of translation. He further argued that theoretical frameworks drawn from Western or even post-Soviet experiences do not serve to illuminate cases like Wuhan. In trying to think through the ways in which smart cities manifest themselves in localized contexts, Dr. Cowley and his colleagues have found the following categories to be analytically useful – discourse, institutions/actors, materiality, and spatiality. Dr. Willis presented the learnings from a now-concluded project titled ‘Whose Right to the (Smart) City’, that explored how marginalized communities survive the onslaught of smartness in cities spanning India, UK, and Brazil. It was evident through the project that throughout the Global South, the enactment of smartness by way of policy was pro-actively intensifying urban inequality. This was observable through the perpetuation of segregation, income inequality, gender disparities, and patterns of displacement from the centre to the margins. The particular case study of solid waste management in Chennai, India showed that the technocratic ‘solutions’ envisaged in the smart city proposal failed to account for the large force of informal sector labour that is central to the operations in this sector. The case further documented the displacement of street vendors and hawkers through the smart city interventions. At the same time, it was clear that the planned interventions were being rolled out at snail’s pace and that opens up the possibility for narratives of smartness to be reclaimed by marginalized groups. In her presentation Ms. Millan shared insights from her doctoral study in Medellín, Colombia using participatory videos to trace understandings of innovation, design, and technology usage. Through these explorations she finds parallel and competing narratives of innovation that disrupt the global narrative of smartness. This in turn is helping to develop the context-specific interpretation of smartness in the Spanish-speaking world. Please find his presentation slides here. Dr. Zanetti’s presentation focused on the town of Milton Keynes and how a smart cities platform aimed at community-based generation of renewable energy has been productive of new forms of social differentiation. Drawn from a project jointly executed by the Open University of Milton Keynes and the University of Oxford, the presentation elaborated on how planners in the private sector banked on conventional categories of social difference such as age, income, and property ownership to identify ‘good’ individuals for the smart city interventions. At the same time these interventions generated new forms of social inequality for instance through the construction of the exclusive category of ‘green citizenship’ that enabled certain residents to access the benefits of renewable energy while leaving others out.